Sarah Dickins wants to bring "make do and mend" back into fashion. 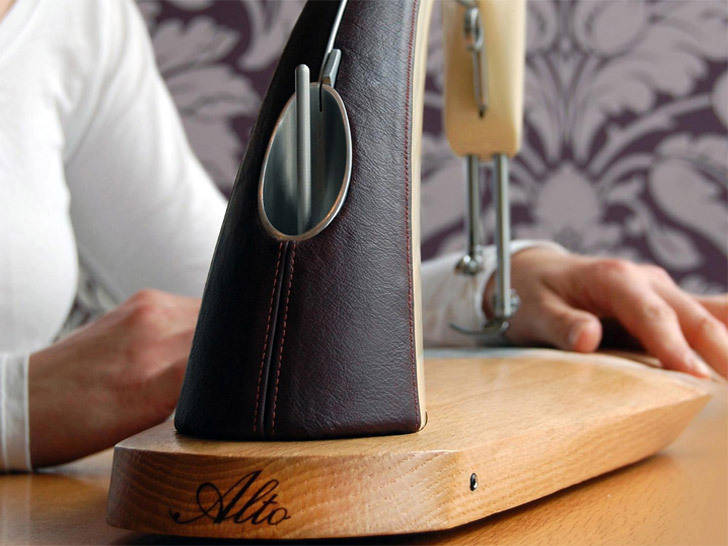 Her "Alto sewing machine, a contender for the 2012 James Dyson Award, combines sleek, vintage-inspired lines with beginner-friendly controls to encourage display and invite frequent use. "Sewing machines are ugly and complicated which puts beginners off sewing," says Dickins, a student at Loughborough University in the United Kingdom. "By increasing the appeal and accessibility of sewing, Alto encourages users to ‘make do and mend,’ inspiring them to recycle, customize, and repair clothes which would otherwise end up in the bin." An international student design competition running in 18 countries, the James Dyson Award is part of the James Dyson Foundation’s mission to encourage emerging designers to “create, challenge, and invent.” Its brief: Design something that solves a problem. Dickins took issue with her generation’s careless relationship with clothing, which is more frequently tossed than mended. Dickins, for her part, takes issue with her generation’s careless relationship with clothing, which is more frequently tossed than mended. Most conventional sewing machines, however, have a steep learning curve. Her solution was a product that not only demanded to be placed in full view but also simplified manipulation for novices. But even sewing veterans may be loathe to haul out their machines for re-hemming or other small repairs. “Far from the iconic Singer machine which sits proudly displayed on the sideboard, the modern day sewing machine is more often consigned to the under-stairs cupboard,” Dickins adds. Her solution is a product that not only demands to be placed in full view but also simplifies manipulation for novices. A metal guide that runs from reel to needle, for instance, makes threading a cinch, while pressure sensors along the needle plate and in the rubber foot allow the beginner to control the machine’s speed in a manner that’s natural and intuitive. A flexible drive shaft replaces the traditional pulley system to create Alto’s distinctive arch, increasing room for fabric and improving workspace visibility. Where is the power cord? Is it rechargeable? It's certainly beautiful and appears quite functional. When will they be on the market? I'd like to know what veteran seamstresses think (like myself). I'd love to test drive it. It looks like it would just be a mending type machine. Hmm. Intrigued. Beautiful design, interested in knowing the price and when available. As a self-taught sewing machine operator (thanks youtube) I've done rough repair on stuff like jeans and camping gear, and the complexity of the machines has always been a source of frustration so maybe this new one will make it easier to put a patch on a knee or repair a ripped-out or worn out groin in heavy material. I certainly applaud the approach to repair stuff and to make our own. Cheers. This Alto sewing machine seems like the perfect melding of old and new. An organic, almost steampunk use of wood and leather - paired with user-friendly modernity. Bravo. It certainly looks interesting especially with the larger area in the throat. My quilters eyes love that. I wonder though how the pressure would work through something think like a quilt, how you both press at the edge and move the item through and where is the bobbin, is there a bobbin. Love to know more, like if it is possible to see in person!?! I like the design. However I am not sure about pushing down on the plate to control the speed and the fabric all at the same time. I have been sewing for over 45 years. Everything from baby and doll clothes to a wedding gown. Plus quilting, etc. I could see this more for clothing and small things, not so much for quilts and heavy items. I just don't see it holding up and standing in place when trying to sew a bigger quilt or larger clothing item. Good idea..but needs some more work. As a veteran sewer, I can't imagine trying to use my hands to both press down on the switch to make it go, and feed the fabric. it sounds unbelievably awkward. It's pretty, but I am not sure it addresses the issues that it intends to address. Pretty likely that a mending machine would need a blind hem stitch--which I don't see. Does it zig-gag? I don''t see a way to change the width of the stitch, but the throat plate looks like it accommodates a zig. I was desperate to find a video of the Alto in use, but failed. How about we see it work? As a seamstress, I wonder how it sews. As an eco-entusiast, I wonder how eco friendly it is. As someone who loves simplicity and style, I say I want one!! I just have a button on the front of my sewing machine that i start and stop the machine. I think pressing down to start the machine will get me pain in my hands or wrist area. I love the style, very basic machine. Kind of reminds me of the Model T's Ford built. It appears to be a light weight machine. How does it stand to tugs and pulls? What if i need to zigzag something? I have an old Singer G model made in 1913 that still works great with only straight stitch. I get my leg exercises in too when i decide to sew on it. This Alto would be perfect if it had the zigzag built in with it. WOW! Looks fabulous. As a long time home quilter, I would love to try this. Looks like the start of something wonderful!! Sure woukd like to knw more about this machine. Would like to know where I can buy this. I think this new sewing machine is GREAT! I would love to give it a try myself. The way it works makes a lot of sense and I agree that the way she has it working does make it easier for a person just starting out more inclined to have success with their project. Great JOB! I love the look, but if I understand right, when you press down this controls the function of the machine...I see lots of DRAG when you are pressing and trying to feed the quilt, garment etc. In my mind this would not work for mending either, as you still need to guide the garment at the same time you are pressing down. Good try tho. I may want one when the bugs are worked out. QuitlDiva! I love the modern look of Alto, the leather covering and the fact that it looks so light. However, our machines need to be covered, those of us that sew, have a special table where the machine sits, ready to be used in a jiffy. What I would love to see is a serger, tht is not so terribly complicated to thread in such a minuscle area under the sewing plate. Congratulations to the designer of this new sewing marvel. Wish you all the luck in getting it to market. i just like the fact that someone is looking at the task in a new way with a view to improving the solution. it may be a simple and small thing, but everything grows from there. Our machines have evolved upwards and are now computers so yes a huge learning curve. When nothing has changed at the low end for years then maybe that is where you find opportunity....and it looks slick! As a quilter, this might be a nice machine to bring to workshops for stitching blocks instead of lugging a 50+ machine. I would love to try this one. i want one, where do i buy? Here is my problem. We all keep making Comments and no one from this company is telling us a thing.I am wondering why this is.Maybe I am one of those people that would like a answer to my questions. I underddtsnd that this machine is new but,still would like to know the (When,How ,and where. I think most commenters are missing the whole point of the Alto - it's a very basic sewing machine for absolute beginners. That was the designer's purpose - make a sewing machine for the simplest of repairs. This is basically a fancy version of that old plastic Singer Stitch Sew Quick. Experienced sewers and quilters would not be satisfied because it only offers ONE stitch. Wow, she is a thing of beauty! I am totally interested. I think many of the posts have good questions that need to be addressed. If the tension is wrong, the project will be wrong. If the feed dog is good, that could address the amount of hand guidance required. Yet, hands will always be need to be free as possible. When you consider that most machine work is in the form of straight stitching and the more specialized the art gets, the more machines designed for specialty work are needed. I currently have two machines, looking for a third and this would be an excellent addition to my sewing stable! I love the style and portability of this work of art. Ok , were do we buy one and how much is it? Thank you, Amy H,FL. Reading through the comments first, I looked at the pictures which address all of the "problems" people are pointing out. The bobbin is located on the right side of the machine at the back. There is no "button" to push; there is a presser switch underneath. Hold the fabric with both hands and simply push down lightly as you feed the fabric through the footplate. Very elegant and beautiful design. I hope to see this available soon! Would like to know the price. Although wonder how long the flexible drive last. I can't read the article because the stupid Azek Pavers ad won't go away. It's a pity when advertising block content. If this makes a button hole, sews zippers and has a stretch stitch, I'd buy it! Want. When can I have? Where can I get. Need. Alto: An Intuitive Sewing Machine That Encourages "Make Do and Mending"
An international student design competition running in 18 countries, the James Dyson Award is part of the James Dyson Foundation's mission to encourage emerging designers to "create, challenge, and invent." Its brief: Design something that solves a problem. Dickins, for her part, takes issue with her generation's careless relationship with clothing, which is more frequently tossed than mended. But conventional sewing machines have a steep learning curve. "Observations and interviews with beginners and their instructors highlighted issues which are off-putting for the first-time user," she says. "Beginners often get ‘lost’ whilst threading the machine and find coordinating the foot pedal and fabric movement difficult when controlling stitch speed. A lack of room for fabric on the right of the needle and poor visibility of the sewing area were also highlighted." But even sewing veterans may be loathe to haul out their machines for re-hemming or other small repairs. "Far from the iconic Singer machine which sits proudly displayed on the sideboard, the modern day sewing machine is more often consigned to the under-stairs cupboard," Dickins adds. Her solution is a product that not only demands to be placed in full view but also simplifies manipulation for novices. A metal guide that runs from reel to needle, for instance, makes threading a cinch, while pressure sensors along the needle plate and in the rubber foot allow the beginner to control the machine's speed in a manner that's natural and intuitive. Feedback from the Alto prototype's trial run has been overwhelmingly positive. Volunteers described the experience as "very natural," agreeing that "you automatically know how to use it."